Respiratory therapy provides a variety of respiratory care treatments and education for patients of all ages. Respiratory therapy is a support service working with physician clinics, nursing, the emergency department and other medical center departments to deliver the most state-of-the-art health care to patients at Clarke County Hospital. All services require an order from your physician. It is also recommended that you bring your medication list with you. Pulmonary function tests are a series of measurements designed to tell your doctor how well your lungs are functioning. They help determine the presence of lung abnormalities, progression of lung disease and a course of therapy and treatment. Most pulmonary function tests include spirometry, which requires patients to breathe through a mouthpiece to record the amount of air breathed in and out. How will the tests help me? 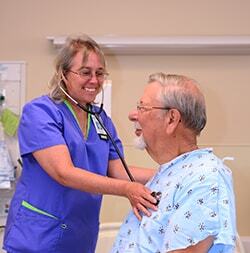 They will help your doctor diagnose lung problems (such as asthma and emphysema). They will also help your doctor plan your treatment and evaluate the effectiveness of your current medications. A screening test may take about 30 minutes. A complete test (full PFT) will take from 1-2 hours. Do not smoke 4 hours before the test. Wear loose clothing so you may breathe comfortably. Do not eat a big meal before the test. Discontinue inhaled/nebulizer medication for 4-6 hours before the test.